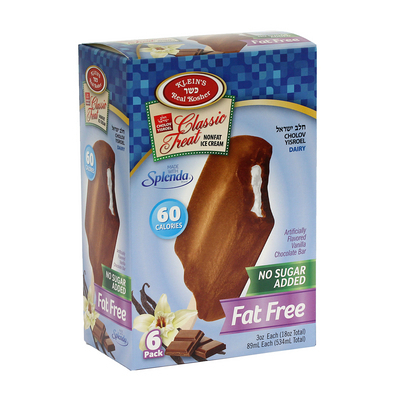 Indulge in a creamy chocolate vanilla bar that is as great in taste as it is for your waist. Klein`s Healthy Habits ice creams are extremely rich in texture but remains astoundingly sugar free, fat free and low in calories. So go ahead and savor the delicious bar! Unit Size: 6 pk – 18 oz. Ingredients: skim milk, maltodextrin, malitol, polydextrose, nonfat dry milk, cocoa (processed with alkalai), soy lecithin, guar gum, xanthan gum, carrageenan, sucralose, artificial flavor, artificial colors: ( YELLOW #5, YELLOW #6 & RED #40).